LAS VEGAS – A lot of folks picked Anderson Silva to defeat Chael Sonnen on Saturday in their rematch for the UFC middleweight title. But not even Steven Seagal, the long-past-his-prime actor who laughably tries to take credit for the mind-blowing moves the 37-year-old champion repeatedly pulls off, could have imagined the way that Silva would have ended this heated rematch before 15,016 rabid fans at the MGM Grand Garden. The trash-talking Sonnen was doing exactly what he said he would for the second fight in a row. After dominating Silva for four-and-a-half rounds only to succumb to a triangle choke at UFC 117 on Aug. 7, 2010, Sonnen once again was having his way with Silva. Sonnen took Silva down just four seconds into the fight and Silva never left his back. Silva defended himself much better than he did in their first fight, when he came out of the round in bad shape. Still, Sonnen landed a number of punches and did enough that judge Junichiro Kamijo scored it a 10-8 round for him. The second round turned, though, after Sonnen failed on a spinning back fist, a high-risk, high-reward maneuver. He tripped over Silva's leg and, for all intents and purposes, the fight was over. Silva pounced, ripped Sonnen with punches and a perfectly placed knee to the chest, and stopped him at 1:55 of the second. "I worked on my skills, but I was a dufus and I fell down in the middle of battle," a glum Sonnen said. Silva is beatable under the right set of circumstances as Sonnen proved in both of their fights, but it's not going to happen when his opponent makes the kind of mistake Sonnen made Saturday. Had Sonnen connected with the spinning back fist, the fight likely would have been over and he would have been celebrating a championship. 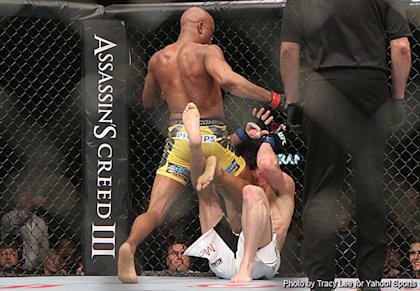 Silva, though, capitalizes on just about every miscue his opponent makes. Silva is a brilliant counter puncher, who is lightning quick. He also has the kind of killer instinct that boxer Mike Tyson showed in his prime and he pounces when he sees an opportunity to finish. "It's amazing what he's been able to accomplish, and what he continues to accomplish, at his age," UFC president Dana White said. "That's the thing nobody ever thinks about. Nobody ever talks about it, but this guy is pushing 40. He's an amazing fighter and an amazing athlete." White called the fight "without question" the biggest in UFC history. As proof, he noted that the live stream of the news conference Tuesday set a record for most streams, surpassing the old mark by 1 million. Much of that was fueled by Sonnen's unexpectedly brilliant performance in 2010, when he came within 1:50 of winning the title. Add on his non-stop trash talking and it added up to one of the UFC's biggest nights. The UFC 148 card was pretty much a downer until the main event. Even the co-main, between Tito Ortiz and Forrest Griffin, was hardly entertaining stuff. White said following the news conference "both Tito and Forrest looked really old." The fight seemed to be in slow motion. But the anticipation for the rematch was so high that all was forgiven by the time that Sonnen and Silva hit the cage. Sonnen entered to a chorus of boos, but Silva was received by the many Brazilians in the crowd as a conquering hero. His stature only figures to rise after scoring yet another dramatic win, raising his UFC record to 15-0. There isn't anyone on the horizon who would appear to have a good chance to beat Silva other than Jon Jones, which brings up the only downer of the night for Silva. During the post-fight news conference, he was asked if he wanted to fight Jones. Silva shook his head and beamed. Silva is ranked No. 1 in the Yahoo! Sports ratings and is generally considered the greatest fighter ever. Jones, however, is No. 2 and is closing in on the champion. Silva’s actions in the cage make him like super human, but he came across as intimidated with that answer and it was disappointing when he didn't embrace the challenge. White, though, said Silva is different than most fighters and that the process of lining up his fights is unique. "He said he wouldn't fight Chael Sonnen, either," White said. "He's such a unique individual to deal with. You know me. I've butted heads with this guy, that guy, we fight and we argue. But it's such a different process when I'm dealing with this guy. I respect him so much, and I swear to God, it's like dealing with an artist or some crazy, talented actor. That's what he's like." He's so far ahead of the field at middleweight, it will almost be like a showcase when he fights. The Jones fight is the only one that makes sense, assuming Jones gets past Dan Henderson on Sept. 1 at UFC 151. He's so good, he left those watching just about speechless. "I'm in awe of this guy," White said, nodding toward Silva. "I've said it before, but he's the greatest fighter ever, ever to be involved in mixed martial arts. ... He's awesome."